In case you didn’t know, casinos don’t have windows. Typically, it’s really difficult to see outside in any way from the casino floor, and it’s fairly well-known that this is because they want you to exist entirely inside the reality of the casino while you’re there. Everything, including the patterns on the carpet, is tailored to pull you into a place where anything is possible: where you could win $1,000,000 on nickel slots; that cute blonde really does like you (and really isn’t a prostitute); where you really are a high-rolling consultant from NYC (and not a debt-strapped state employee from Wisconsin). They spend a lot of money to create this illusion, and they are pretty good at it: while you are there, you can believe anything, and it feels real. 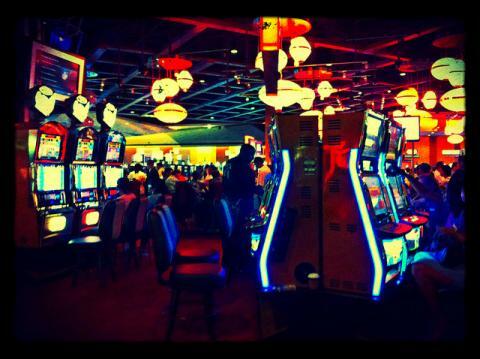 But guess what: eventually you have to leave the casino. And rather than being up $20,000, you’re down $450 and you have to make rent. I’ve been accused of leading “downer” worship sets. In fact, I was once officially reprimanded at a church for not putting enough “uplifting and joyful” songs into our weekly sets. What’s more, at my church we are in a season that has found us playing a lot of songs that dwell on pain and suffering (and yet choosing to still sing, no matter how tentatively). I’ve even made a concerted effort recently to pull us away from these songs, but it just seems like we are in a season of pain and struggle, and as musicians and pastors we simply need to speak to that. Lately, I think of it as “Gap Worship”, songs that stand in the gap between exhilarating hope and devastating despair, between joy and pain. So many times our churches can begin to resemble casinos, both physically and emotionally. We truly want to pull people into a reality that says “Hey everyone remember: Love wins! Just give your life to Jesus and save your soul! Get on board with God’s mission!” To that end, we do a lot to pull people into the reality we are trying to create. People are going to walk back out and experience the devastating reality of their lives: debt, illness, loss, loneliness, anger, isolation. I am absolutely not advocating abandoning hope. I am advocating timeless, non-contextual worship experiences that don’t connect with reality. Let’s face it: even Jesus knew it wasn’t Easter all the time. One of the great (and under-utilized) tools for planning worship that doesn’t look like and feel a casino is the church calendar. Used creatively, the liturgical calendar (broadly, Advent, Christmas, Lent, Easter, Pentecost, and “Common Time”) can help us address the pain and doubt (as well as joy, hope, and anticipation) of the individuals we live and do ministry with. Advent is a season of preparation and anticipation. It is a great time to talk about the meaning of Jesus’ coming, and the “gap” between the our world, and the vision of the world that He comes to inaugurate. Christmas is joy and celebration, celebrating “God-with-us.” In the midst of the depth of winter (death), life springs up. Even in the absence of hope, God is working. Lent walks us through our mortality and our frailty as we think about Jesus’ journey towards the cross. It’s a time to mourn and to sacrifice and abstain from comfort in order to shake loose sin’s hold on areas of our lives. Easter bursts forth with celebration and new life. It screams at the world, “Whatever you think you know about life, there is a deeper reality than you think.” At the moment of great sadness and even evil, the victory is truly won. Pentecost addresses the life that the Holy Spirit brings, and also the creation of the church. It can be a time of community and connection. I’m certainly not an expert in the church calendar; my church only observes a couple of these seasons. However, I’m fairly convinced that these seasons holistically address the human experience, and avoid “Casino” worship. For the time being, I’ll keep my downer worship songs. I can see outside, and it’s not always 75° and sunny. Reality is going to set in when they leave your sanctuary, and we don’t worship a God who asks us to stick our head in the sand. We don’t deny death; we defiantly claim that life—actually resurrection life—comes out of death. This entry was posted in faith and tagged church, Pain, worship. Bookmark the permalink. As a person who attends this church, I am really grateful for the way the worship songs have pointed me towards resurrection in various struggles throughout the time I’ve been in Tallahassee. And thanks for this post. It’s timely. Eric, you are sounding more Anglican everyday. 🙂 Well said. I agree that the calendar helps to remind us of the cycles in life and keeps us grounded in dealing with the vicissitudes of life. Life is full of ‘downer’, ‘joy’, ‘routine’, etc. Sometimes the calendar can help to remember that. Happy Feast of St. Barnabas. First, let me say that Eric is my nephew, and I am very proud of him and his entire family. I have never considered life to be a downer. I attend a Methodist Church and I love to go early and sit in the quietness of the sanctuary. Sometimes it is like connecting with my past.I don’t need to entertained or worked into a tizzie. I just want quietness, meditation and when I depart I feel rejuvenated,even at peace. I love the service,appropriate music and the fellowship. But most of all I love the calm that overcomes me,my family if only in MY mind. fitting that i’d read this the day AFTER i sat in a five-hour meeting planning the next 18 months on our church calendar. Eric, you are SOOOOO right. We’ve often heard that our church is the only place where people feel like their pain is understood. That there is someone who can cry with them and just ‘be’ with them. Sometimes I do feel like some churches are in the entertainment business as it’s all about the show. Thanks for your insightful thoughts ! You’re welcome, Laura, and thanks (a) for the encouragement, but moreover (b) for your ministry in Ukraine!